If you've not heard of it, the Golden D6 is a miniature painting digital hobby magazine that is the brain child of Melbourne, Australia's Adam Jones. Its goal is to recapture the feel of old school gaming magazines, such as Dragon and White Dwarf, and it's been gaining steam thanks to the Twitter community. I never subscribed to old school White Dwarf or any of the old gaming magazines that were out in the 90s, so I can't compare how well the Golden D6 emulated them, though. The magazine has some solid production value and the few issues I've read of it (issue 9 and 10) have had a nice variety of articles in it. Why am I talking about the Golden D6? Well, that's because my Kingdom Death: Distracted piece is featured in this months issue. But, that's not all, she's on the cover! Amazing, I'm super happy that she was chosen, it's an honor. Especially after looking through the issue and seeing all of the other great pieces in the book. This is actually the 2nd time I've contributed to the magazine, the first was my write up on Super Ninja Ambush for Super Dungeon Explore. That article was in issue 9. For issue 10, Adam put out a call for models of all shapes and sizes for a showcase. I had a really tough time deciding on what piece I wanted to submit for it. Interestingly enough, not a single one of those was a chibi figure. I tried to take pictures of each of them and then after looking over them all, I decided that the pictures of Distracted looked the best. It also helps that she's probably my favorite piece out of all of them. I would have loved to submit the Colossal Skeleton Battle, but due to the size of it and amount of characters, it made it difficult to get quality angles of every part of it. The same could be said of The Keeper and his Zombie Horde, but that also had a strike against it because part of the base was lifted up. I'll need to fix it later. Overall, it's a good thing I went with Kingdom Death: Distracted as she was lucky enough to make the cover. But I would have been happy just to have had a model in the issue. 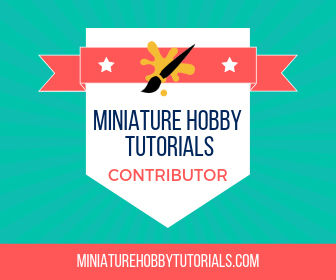 If you like pretty pictures of miniatures, you should definitely check it out. There's a lot of good stuff in this issue. I especially like Look Away, by David Colwell, Alexander's Sylvaneth army and Nils' Witch Queen. That's it for now. If you'd like to read up more on the Golden D6 magazine, check out the main page here. Also, if you'd like to get a copy of issue 10 and check out everyone's excellent work the store page is located right here.